Posted on Sun, Mar 11, 2012 : 11:20 a.m. The city of Ypsilanti is beginning work on the a deteriorating stretch of Grove Road between Interstate 94 and the Ypsilanti Township border just south of Emerick Road, but it still may not see its complete physical reconstruction until the 2014 construction season. The city is contracting with an engineering firm to complete design work for the project by the end of the year. Stan Kirton, director of the department of public works, said the project will be shovel-ready when funds are available in 2014 or will better position the city to receive other federal dollars that might become available prior to then. Either way, the project will not be done this calendar year. The $570,000 rebuild will require the removal of concrete, curbs and gutters, and the road will be repaved in asphalt. Bike lanes will be added, and guard rails will see improvements. The city is beginning design work because it had budgeted $45,000 for it in fiscal year 2012, and the total cost is about $52,000. Around $352,000 of the rebuild's funding will come from the Federal Transportation Surface Program, and the city will pick up the tab for the remaining $219,000. Part of the reason for the delay is that Ypsilanti was given more than its share of federal dollars for road projects in previous years. Federal road money is distributed in the county via the Washtenaw Area Transportation Study. WATS Director Terri Blackmore explained Ypsilanti was “frontloaded” with funds since 2009. It received $571,000 in fiscal year 2009, which is twice what should have been allotted. Ypsilanti received no federal funds in fiscal 2010, $700,000 in fiscal 2011 and $212,000 in the current fiscal year. Additionally, all road funds will soon be cut by 36 percent, due in part to less fuel consumption in a tough economy. The stretch of road, which is located near the Gault Village Shopping Plaza, has been a lingering point of contention between Ypsilanti Township and city of Ypsilanti elected officials. 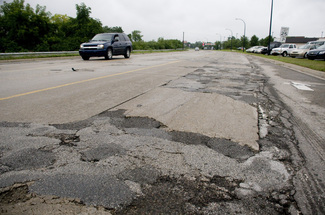 Ypsilanti Township residents - particularly those in the adjacent neighborhood who drive the stretch of crumbling road almost daily - have regularly complained to Township Supervisor Brenda Stumbo about the road, which they say has been disintegrating for more than a decade. In October, the township offered to loan the city money to repave the road, but City Council rejected the assistance. Opposed council members argued that it was a waste of money to only repave and not completely rebuild. A rebuild is expected to last 20 years, while a simple overlay is only expected to last several years. At a subsequent meeting, council chose to fund a rebuild of a section of West Cross Street running between Washtenaw Ave. and Wallace Boulevard instead of Grove Road. Mayor Pro Tem Lois Richardson suggested that the city give the portion of Grove Road to the township because there is nothing along it and it is of no use to Ypsilanti, but the idea gained little support. too bad they,THE CITY/TOWNSHIP dosen't do anything to fix Clark at Leforge road also. this road has been an awful road to travel on ever since i've lived here 30 yrs. ago.nobody seems to want the project. (like the road is a orphan child).I've often thought about calling the invesigators on the news for help. Mon, Mar 12, 2012 : 2:16 a.m.
&quot;In October, the township offered to loan the city money to repave the road, but City Council rejected the assistance. Opposed council members argued that it was a waste of money to only repave and not completely rebuild. A rebuild is expected to last 20 years, while a simple overlay is only expected to last several years. &quot; But will the road even last until 2014? If I remember correctly the townships offer had not specified payback time...they should've just taken it to do a repave to make it last a couple more years. Mon, Mar 12, 2012 : 3:46 p.m. I would rather have this road done right, then done half baked. Glad to hear we are finally getting a road worth driving over. They did same to Stadium Blvd and they did this in piece meal. Real nice to drive over. Once done? This will or should last 20 or more years. Mon, Mar 12, 2012 : 12:29 a.m. I live in the TWP and have to navigate that stretch of Grove Road quite often. I read the part where the City of Ypsilanti chose to work on West Cross instead of Grove Road. From what I have seen, the West Cross project consisted of putting in brick crosswalks at many street corners, so that the little darlin's at EMU would have an athestic view of the street as they went to and from classes. What's a few bumps and rattles and clunks to my vehicle, when I know that the college kids have a cute little walkway???? Glad to know that Ypsilanti has it's priorities in order. I'll remember that as I pass over that wretched road on my way to shop somewhere besides Ypsilanti proper. Actually, that is not the section that they picked that you are referring to. I believe that area of Cross St. that you mentioned received some sort of grant for all that work as well as the spiffying up of the buildings and the LED lights. The section of Cross St. that the city chose over Grove is just further west of the water tower - between Washtenaw and Wallace. Last I read, work is to be started sometime this spring so you have plenty of time to still drive over it and enjoy those ruts as well. Sun, Mar 11, 2012 : 5:55 p.m.
Tue, Mar 13, 2012 : 6:05 a.m.
Lowest per capita spending because funds are mismanaged. You don't have to spend a great amount of money to run a city into the ground. Sun, Mar 11, 2012 : 5:51 p.m.
One of the worst, maybe the worst road in Washtenaw Cty. Driving it over 15 mph is to risk major suspension damage. Mon, Mar 12, 2012 : 4:07 p.m.
try coming down mott rd. they just patch potholes and just makes it worse. Glad to see this will finally get done... too bad it will probably take another 2 years after countless years of arguing about it. As a lifelong Ypsilanti resident I have never understood the failure to agree on anything when it comes to the city vs. the township. Of course it is all about money and it is only going to get worse in the coming years if we continue to try to operate the city and the township as separate entities that constantly compete with each other. Sun, Mar 11, 2012 : 4:19 p.m.
Be glad you live in Ypsilanti Township and not the mismanaged City of Ypsilanti. Their property taxes are much lower the services are a much better quality and there are more services. They attempt to attract more businesses they do not &quot;buy them out a with over inflated prices&quot; and ask them to leave. It is a shame what City Council has done to that City, just take a look at the Michigan Ave section. There is not one person who can be proud of that mismanagement. So why would they fund their own roads? That section of pavement looks like photos from Afghanistan I've seen. I go all the way down to Harris Road to cross over, a waste of fuel at $4.00 per gallon. No Thanks to City of Ypsilanti. I grew up in the township and have seen it get better all my life, while the City has down nothing but moved in the &quot;opposite Direction&quot;. In this country you get what you &quot;elect&quot; so someone must like those conditions they all need to be voted out of office!